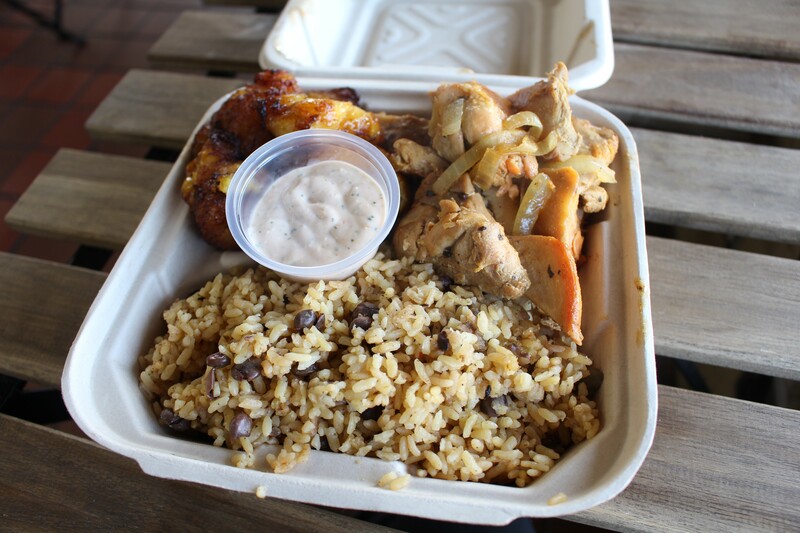 Garlic chicken, sweet plantains, and rice at La Perla. Five days after Hurricane Maria struck Puerto Rico, Jose Ortiz flew back to the place he was born to find his family had lost everything. At that point, the chef had already decided to take a break from Borinquen Soul, which was for many years Oakland’s only Puerto Rican eatery. He stayed in Puerto Rico for a month, feeding hundreds of families and soon plotting a return visit. But when he got back to Oakland, he found out Borinquen Soul owner Eric Rivera was closing up shop. The landlord reached out to Ortiz, and he decided that location — inside a liquor store in the Dimond district — needed to keep serving Puerto Rican eats. In December, he unveiled La Perla (2020 MacArthur Blvd.). While Borinquen Soul kept things simple with grilled chicken, pasteles, and Puerto Rican rice, Ortiz has amped up the offerings with La Perla — namely, there’s now lobster tail crowning the mofongo, a fried plantain mash. He also added whole fried red snapper and changed the empanadillas, but he left Borinquen’s prized chicharrón recipe untouched. Apart from the menu, Ortiz said he’s focusing on consistency in flavors, presentation, and service. But Puerto Rico continues to loom large in his mind. Ortiz has big goals in Puerto Rico. With his nonprofit COPA Inc., he’ll return for one week at the end of the month. He’s bringing a generator because everyone in his sister’s community lost electricity. He wants to build a community kitchen where folks can cook food for themselves or for others who are struggling. And he plans to open a small laundromat so Puerto Ricans can easily wash their clothes. That’s why he’s turning his grand opening party on Saturday, Feb. 24, into a fundraiser for his relief efforts in Puerto Rico. Cash donations are most appreciated, though he welcomes canned food as well. At the party, there will be live Puerto Rican music, a whole roasted pig, and pincho, Puerto Rican kabobs.